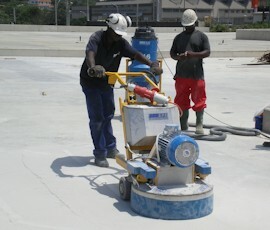 For the grinding & polishing of concrete, terrazoo, tiled surfaces and the removal of surface contaminants. Range includes machines for light grinding tasks through to the DFG700 triple orbital grinder for heavy duty projects. Successful diamond Floor Grinder products must be well designed with a perfect compliment of weight and balance to allow the operator complete control. All SPE Floor Grinders are designed with these factors in mind. 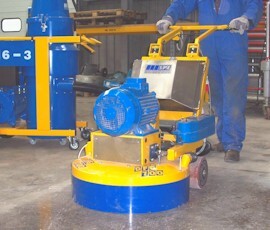 With many years experience the the design and development of surface preparation equipment, and the benefit of modern computer aided design, SPE have developed a range of Floor Grinders with just the right weight to act on the grinding heads to facilitate accurate and rapid grinding. 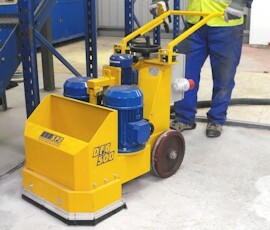 SPE Floor Grinders are available in either electric or petrol powered varieties - all designed to minimise operational noise and reduce impact vibration as much as possible. 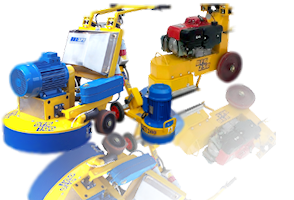 Combined with consistant diamond wear rates and ease of use, SPE Floor Grinders are the ideal, economical machines for floor preparation work. A successful diamond grinder must give the operator complete control and at the same time have enough weight to act directly onto the grinding heads to facilitate accurate and rapid grinding. 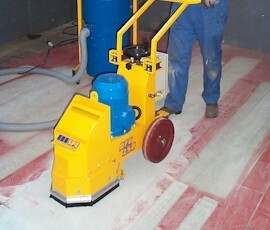 The DFG 400™ Floor Grinder has been developed to meet the competitive demands of the general floor grinding marketplace. 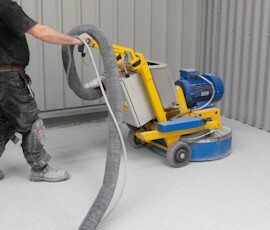 To successfully grind large floor areas a heavy duty floor grinder is required. The DFG 500™ gives complete operator control and at the same time has the correct weight to act directly onto the grinding plates to facilitate accurate and rapid grinding. THE DFG 700 Triple Head Planetary Floor Grinder has been developed to meet the increasing demand for this principle and grinding materials to a finished product. 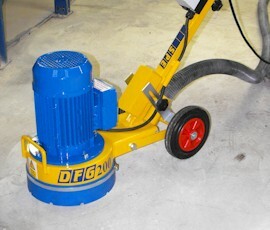 The DFG 1000 is a sit-and-ride / wireless remote controlled 6-head planetary grinder designed for heavy duty grinding and polishing of large floor surfaces.